The Arabian plate had almost undisrupted sedimentation in the Mesozoic and Cenozoic in tropical oceans where the organic productivity was high. With multiple episodes of transgression and regression of the sea level, layers of carbonates have been deposited. Yet the surface geology is not simple in the Mideast. A characteristic feature is the karstic terrain, due to passage of the meteoric water carrying acids through rocks. 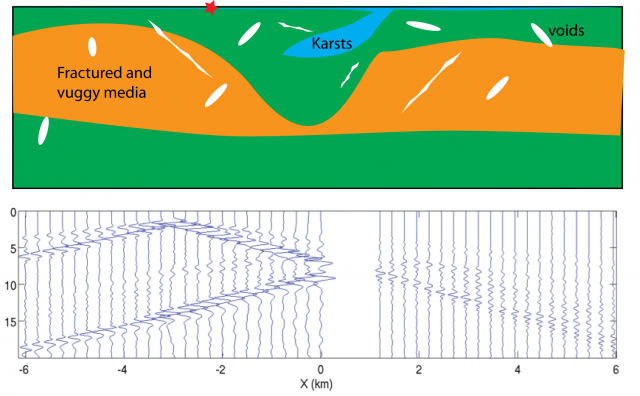 Near-suface karstic features in carbonates pose significant problems in geophysical prospecting for energy and in enhanced oil recovery because these features scatter seismic waves significantly. Karsts, sink holes, vugs, fractures and areas with subsidence potential also pose lurking dangers to constructions. However, if they can be identified and imaged accurately, karsts can be used as disposal sites for effluent waters. To make progresses in all these areas, we study how waves interact with these karstic features and then study their effects on seismic acquisition and imaging. More info can be obtained by contacting Dr. Michael Fehler.